NEWPORT, R.I. (June 26, 2015) – In addition to turning heads with impressive exteriors and elaborately elegant interiors, the world-class yachts participating in this year’s Newport Charter Yacht Show wowed show attendees with their teams of onboard professionals competing in the Crew Competitions that put hospitality and culinary skills to the test. The series of contests – organized by Captain’s Concierge and sponsored by Crew Food Safety Training; Culinary Convenience; and DYT Yacht Transport/Sevenstar Transportation – has become a highly anticipated feature of this industry show, which for its 34th edition kicked off Monday, June 22 and wrapped up Thursday, June 25. Five challenges were presented throughout the week, with the crews of the 130-foot motor vessel Far Niente and the 50-foot catamaran Paradigm Shift, knocking it out of the park to take home all the first-place prizes. Paradigm Shift’s Chef Bonnie Carroll (Annapolis, Md.) started the week with her pear pancetta hors d'oeuvre taking first place in Monday’s Sunset Canape Challenge (open to competitors in yachts 99 feet and below) and then finished with a bang in Wednesday’s Healthy Beverage Challenge (in the division for yachts 99 feet and below) serving her winning sparkling orange and lime drink. 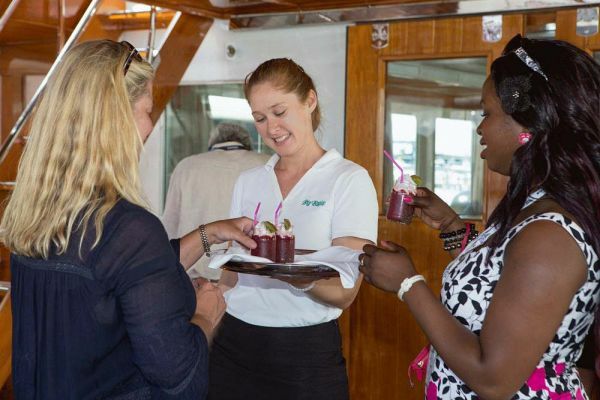 On Tuesday, the Best Charter Yacht Chef Competition (open to all participating yachts) called for the chefs to create a dish that catered to specific dietary needs (paleo, vegan, vegetarian, gluten-free), using a mystery basket of local and seasonal ingredients. Far Niente’s Chef Ben Mercier (Quebec, Canada) won over the panel of professional judges with his vegan raw vegetable sushi dish. His wife Nikky, who is Chief Stewardess onboard, took first place in the Healthy Beverage Challenge (in the division for yachts 100 feet and above) with her medley of dairy-free fruit smoothies and pressed juices. Making a triple play, Far Niente stewardesses also won the Tablescaping Challenge with their vintage boudoir-themed dining table. Additional activities for crewmembers throughout the week included the Pitch & Putt Golf Tournament, which was won by Ivy Wesson of the 116-foot M/Y Vivere. The seaHEX Drone Challenge, sponsored by seaHEX and Fuerte Amador Resort & Marina, tasked captains with landing a remote control drone in the center of a target board and the overall winner was David Gies of the 126-foot M/Y Sea Bear.